Pro Pinball Ultra [Steam, Official Site] was released for Linux this year and a GOL follower gifted it to me, so I took a look to see if it's actually worth others picking it up. The initial bit that put me off: the first thing it presents you with is a login/registration screen. I don't like any game that makes me do that, especially a single-player Pinball game. You can play as a Guest, so you don't actually need to do any registrations. The problem is, it doesn't just link to your Steam account, you have to manually sign up with an email, username and password. No thank you, any time you do this in a game you end up getting their junk emails sent your way. The second annoying thing: the game will download additional content of around 866MB before you get to do anything else. Each time you pick a different pinball machine it will need to again download an additional bunch of data. Each time it downloads, it then needs to unpack the content too. So there's quite a bit of waiting before you can event get to smash some balls around. You also might want to write down the controls or attempt to memorise them. As simple as they are, I haven't found a way to bring them up in-game once you dismiss them and I forgot one key that I just couldn't get to work and I had no way of knowing what it was again. With the annoyances out of the way, it's actually not bad. It certainly looks good, seriously beautiful actually. Crystal clear graphics that look reasonably realistic too, with different angles available to view. It's easily the most realistic looking Pinball game I've ever seen. The only thing I'm not too certain about are the physics of it. It does seem at times that the hitboxes need a bit of adjustment, as I've been able to hit the ball quite easily when the ball is just out of reach. The ball doesn't seem to act like I would expect it too either, but it's possible I'm just so badly out of practice that it is normal. Once you get past the initial annoyances, it's not a bad game overall, but I don't know enough about Pinball anymore (loved it years ago, but it's been a long time) to really get invested in it. It seems like a game for people who already know exactly what they are doing. You can click the little "i" button in the corner and scroll past the story nonsense to learn some of the functions. Why they put the instructions in a hidden away place only after you scroll past a bunch of pointless story I've no idea. It at least works without an issue and it's really smooth for me. If you're already into Pinball you will probably quite like it. When you start it up there's a tiny "i" button in the bottom right corner, it has the backstory and instructions on how to play. I use a ps3 controller over bluetooth with this game, and this is the first game I've ever experienced rumble in the controller, which is a super nice addition, it really enhances this game. It is a brutally hard pinball game though. Since it is so hard I recommend going into the settings once you're in the game (the admin menu), and maxing out stuff to help you out, like amount of balls, how long the ball-save lasts etc, that will help out a lot if you're trying to beat the storymode game. It's really enjoyable though, and not to mention easy to bring up and run some ramp practice while queueing for a strife game. Grifter When you start it up there's a tiny "i" button in the bottom right corner, it has the backstory and instructions on how to play. Thanks, edited that bit to mention it. Funny, I would never have guessed those would have been listed there, since I did go to it and check, but I thought it was just a load of story nonsense. Fancy putting that right down below a bunch of pointless story you have to scroll through. Later I also enjoyed some pinball simulators, but haven't played any for a long time. I guess the time has come again. With all the hoops to get through to play, especially the sign-in requirement, I would never buy that game. It's not a requirement, you only make an account/sign in if you want to be on the online leaderboards. Liam you say in your review that it downloads when you swap tables, does it overwrite the current data so that every time you pick a different table it has to download or is it just the first time you play each table? No. The table is pre-rendered, and you have like 6 different views, you pick the view you want to use and it will download the table assets for your resolution. If you were to change resolution it would download the table for the new resolution but you'd still keep the old stuff downloaded, though you can manually just rm -r a dir. 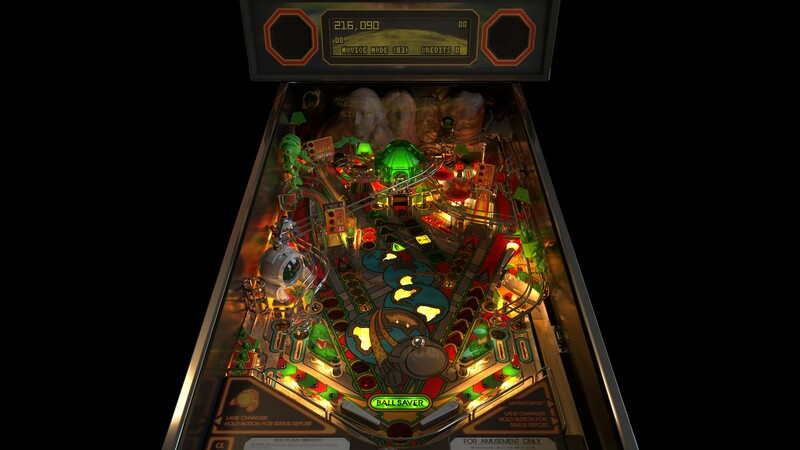 Anyone has news of a linux version of Pinball Arcade ? (currently enjoying it on PS4, would love to re-buy it for Linux). wolfyrion, is this "visual pinball" running on Linux ? Any links if so ? It seems to have all the cool tables. Grifter No. The table is pre-rendered, and you have like 6 different views, you pick the view you want to use and it will download the table assets for your resolution. If you were to change resolution it would download the table for the new resolution but you'd still keep the old stuff downloaded, though you can manually just rm -r a dir. I was misunderstanding what you wrote, thanks for clearing it up for me.